Do you want to know how to create a WordPress website step by step and don’t know How to Create a WordPress Website or blog? and how to code exactly? Hey, Readers, Today I will tell you Step by Step Procedure to create a WordPress Website. You don’t have to be a good programmer to start a blog or to make a Website. There are a lot of tools available on the Internet Like WordPress and Weebly, where you can create an amazing Blog in minutes. Are you thinking to be a blogger for the first time? Well, you don’t have to take more tension. I am here to help you always. you can contact me personally on my FB group, YouTube Channel or just by commenting on this Website. Let’s see How to build a WordPress Website step by step. this process is same for all, a 15-year old guy to a 60-year young guy. What do you need to Create a WordPress Website? 1. How to create a WordPress Website? 2. How to get a .com domain name for free? 3. How to choose a Cheap and best hosting Plan? 6. How to install SSL (https) for your site? 7. How to Write and Publish Your first blog Post? Yes heard it right, Along with Domain and Hosting you have to give your time to set up a blog for the first time. You might be thinking, How? So, let’s see the step by step procedure below to build a WordPress blog. Don’t want to read more, well watch this youtube tutorial video, this will cover Most of the topics related to Start a Blog/create a WordPress website. This Video will depict clear [pcture about How to create a WordPress Website Step By Step? 1. How to register a domain for free? 2. How to choose the Best Web hosting provider? 3. How to Install SSL certificate? 4. How to install WordPress for the first time using Softculous App Installer? 5. How to change your WordPress theme? 6. How to write and Publish your first Blog Post? 7. How to customize your WordPress Website? 8. How to Install Plugins and Which Plugins you need to use as a beginner? 9. How to generate Money from Your Blog? 10. How to be a master of Blogging? One important mistake people generally do when they create a Website/blog is choosing a right platform. Selecting a right platform to start a blog is very Important. It’s like, selecting a structure under which your website will be built. So, If you choose a wrong structure and layout your home will not like your dream home. We always prefer our readers to choose WordPress. It’s easy to use, flexible, reliable and It will provide you with a lot of features which are completely free. Here comes the question how to get WordPress on my website/blog? right. The WordPress will be provided to you when you choose and purchase a hosting provider for your blog. Once you have a hosting account then you will be provided WordPress installation for your blog. We will talk later in this article how to install WordPress for the first time. Please keep in mind, I have talked about .com domain name. Because there is a lot of domain provider who will provide you with a free domain with their self-made extension like .tk, .website, .xyz and more. Which I never recommend. Whatever business you are .com domain is suitable for all and it will help you to target worldwide. Well, you can also choose a domain according to your country and according to your locality and business. In these types of the domain, city name might be used and country extension is valuable. for example – .in for India, .us for USA, .uk for United Kingdom and . ca for Canada. So, we will suggest you to go with a .com domain. But there are certain things you need to keep in mind while selecting a perfect domain for yourself. We have made a separate article for that. Have a look – Best tips to select a perfect domain name? So, I hope you must have selected a perfect domain for yourself. But to get a free .com domain, You need to buy a hosting first. Most of the Hosting providers provide free .com domain when you purchase a Hosting Plan. But, Specially I recommend GoDaddy. See, Getting a best Hosting Plan depends on a lot of things including your requirements also, which is very very important. So you need to analyze your requirements first. Don’t get more confused. I have also made a list of cheap hosting providers and have made a separate article for you to get out of hosting trouble. Have a look – Which hosting to choose? Cheap and Best hosting provider list 2018. As a Blogger, I have tested approximately 5-6 hosting till now for a different purpose. So, If you ask for our recommendation then I will suggest you to choose a hosting plan from these four best hosting providers. I always prefer Godaddy at the first point. being a beginner when you choose a hosting plan from Godaddy. You can easily claim a free .com domain. You can choose Godaddy basic managed WordPress Hosting as a beginner. You don’t have to spend more. Bluehost is also a preferable Host for it better service and uptime guarantee. Most of the Successful Bloggers are using BlueHost. So, You can choose Bluehost also, But it will cost little more than Godaddy which is worth because Bluehost will provide you 50 GB SSD storage. I am currently working on to provide you with pieces of information with very ease. So, after purchasing a domain name and hosting plan next, a small thing you need to do it is – Installing and Setting Up WordPress on Your Blog/Website. You will be provided with your Cpanel Access. Where you can manage all these things like – Adding an Addon domain, Installing SSL certificates, Updating and managing files on your web Server (File manager) and many more. Installing WordPress on your Blog is just a very small and easy process and it will roughly take 1 minutes for you to set up WordPress for the first time. You can do it with Softaculous App installer and you can also take help via chat to your domain provider if you face any difficulty. For your ease, I have made a separate article on this. Related Read – How to install WordPress in Cpanel using Softaculous app installer? Here, there are options to install a new theme by uploading it or by selecting a theme from WP store. I will not recommend you a premium theme as a beginner. But you can choose a premium theme if you can afford. There is a lot of free themes available in the WordPress Store and you can choose any one of them. I will suggest you to try and see the live preview of different themes. If You find any theme beautiful, you can choose that. Your theme must provide easier navigation for users. Your theme must provide easier customization options. Along with these all things, I have also prepared a separate article for selecting a proper theme to start your WordPress blog. Read this article It will be very helpful in theme selection. 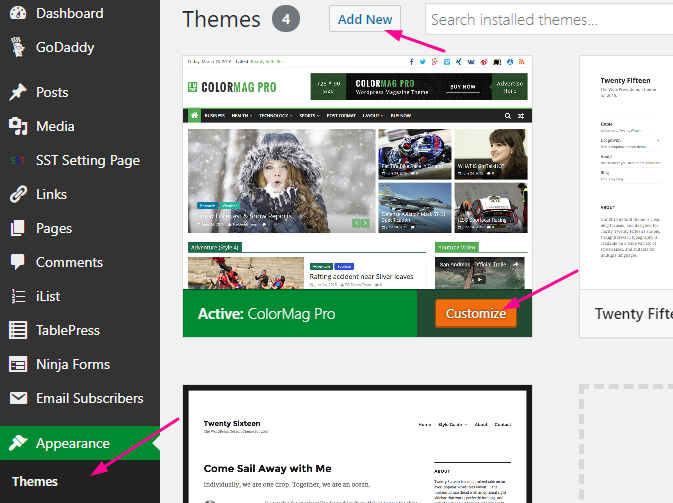 Related Read – How to choose the best theme for your WordPress site? When you are a newbie, I will suggest you to install an SSL certificate with the help of your hosting provider Support. It will be very easy If you choose Domain+Hosting+SSL of the same company. If you want an SSL certificate in low cost then you can choose a positive SSL Certificate provided by Namecheap. It will be available fro in Less than 5$ for the first year. Once You have purchased a Namecheap SSL, Follow the process specified below to Install a certificate. Go to Namecheap SSL Tab, You will find all purchased SSL for your site here. Writing and Publishing a Blog Post is the prime task once your WordPress is set up and live. There are content writers who can write content for yourself. for that, You have to pay them a good money. If you can write by own, I think this is a very good step. 3.. Write title, content and customize your contents properly like Text formatting, Heading and Image/ Media Adding and alignments. All the things are clearly mentioned in the Image. you can follow this image to Know the details. Now, Once you have done with the writing part, You need to set up a featured image. 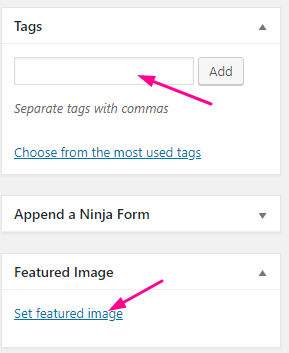 To add a feature image just click on Add feature image and then either upload an Image or add an image from the pre-uploaded images. You can also append forms and you need to specify some relevant tags according to the keywords specified. Once you have done above all part you need to publish your post to get your contents online. 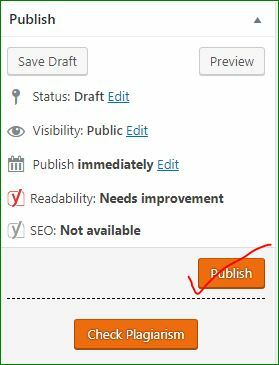 Just click on Publish Button available in the left pane. Hurray, Now your contents can be seen to the whole world. There is a lot of things you need to do to rank your post on top in Search Engines. One of them is On Page SEO. You are highly recommended to read or articles about on Page SEO techniques. You just need to install a plugin to do On Page SEO. 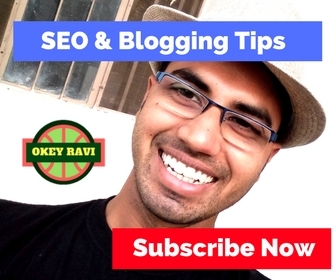 Read Also: How to do SEO of a post with high ranking tips? The plugin name is Yoast SEO, As a beginner, you can start with the free version of Yoast. If you want to set up Yoast. You can read the below article. ProTip – Without the above-mentioned pages on your Website, you can’t get Adsense Approval. if you apply for Adsense without these pages then you will get disapproval reasoned insufficient content. To further customize WordPress you need to add features like contact forms, galleries, sliders, etc, you need to use WordPress plugins. WordPress plugins are apps that allow you to add new features to your website. There are over 50,000 WordPress plugins available. I have made a list of 30 Plugins Which Everybody Blogger needs to use. Have a look at those. Top 30 WordPress Plugin You need to use on Your WordPress blog. We will also recommend you to see, How to set up widgets in WordPress? Widgets will provide you more flexibility and design to your Blog. Note: Widgets are limited to the selection of a theme. Every WordPress theme has their own set of Widgets. There are several ways to make money from a blog. As a beginner, the recommended is Applying Google Adsense and Other Ad networks Like MediNet and Infolinks. You can use any one of them Ad networks. to use these Ad networks on Your Blog. Before applying for these Ad Networks You need to follow some criteria, Some of them are listed below. 1. You must have at least 10 good quality content on your Blog. 2. You must have SSL installed. 3. Your Website must have proper navigation. 4. There should not be any category or Menu item in which there is no content. If you have done all the things specified then you can apply for Adsense, MediNet or Infolinks. We will recommend you to go through 15 things you need to consider before applying for Google Adsense program. you can also do affiliate Marketing and can provide Sponsorships on Your Blog If you have a good audience. to do affiliate marketing you can add Deals page on your blog. You can also use two ad Networks together like Infolinks+Adsense to increase your income. 1. On-page SEO – On-page Seo is done on the posts. There are certain things which you need to follow to optimize your content in a better way. Follow this guide to Do proper On Page SEO. 2. OFF-Page SEO – Off-Page Seo mainly includes Link Building techniques. it is done after On-page Optimization. 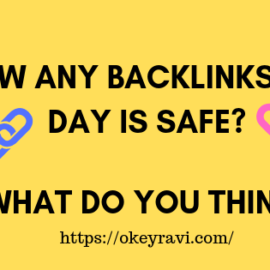 there is a lot of ways to gain a backlink. I have made a list of 105 best way to generate and get backlinks for free. I think You might have understood all the process of How to Create a WordPress Blog? 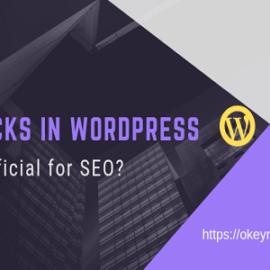 Yet you feel that you are not able to understand anything then I will recommend you to Watch Our Youtube Video About Starting and setting up a WordPress Blog? I am trying to help thousands of people who want to know How to create a WordPress website and they are feeling some issues in this. Well, this is not a tough Process but still If you have any query you can comment below. Here are the top queries asked by a Newbie when he/she wants to create a Website for the first time. 1. Can I create a website without WordPress? Yes, there are several other blogging platforms available. But, WordPress is by far the best solution on the market. 2. Can I create a blog without hosting? No, that’s not possible. Web hosting is where your website files are stored. All websites need web hosting. If still, you want to start a Blog without hosting then you need to start with Blogspot. It’s free. We only recommend Blogspot for learning Process. 3. How much does it cost to create a WordPress Website? To start a Blog you don’t have to spend more. You just need to buy domain+ Hosting+SSL. I already have recommended Godaddy, BlueHost, and Namecheap or this above in this article. 4. Can I start a blog without my parents knowing about it? 5. How to Create a WordPress Website and remain anonymous? If you want to have a public-facing blog but want to remain anonymous, then you need to make sure that your domain has WHOIS privacy turned on. Often people use a pseudonym/nickname to write under. You should also create a unique email just for your blog. It goes without saying, don’t post your pictures or anything on the blog. 6. How do I add a podcast to my WordPress blog? 7. How do I come up with blogging ideas to write about? Here’s an excellent guide that has 103 blog post ideas that you can write about today. 8. Can I use multiple languages on my Website? Yes, of course, you can write blogs in multiple languages. But always keep in mind your reader’s attention. 9. Can I create a multi-author Website in WordPress? Yes, Of course. WordPress provides you facility and flexibility to add multiple Author to Your Blog. You just need to Add the person to Author Section. 10. How Much Can I make of Creating a WordPress Website? Well, there is no end, it all depends on Your labor. your choice of interest. Your area of contents. the ad networks you have chosen, your Blog Strategies, Affiliate marketing embedding and on many more kinds of stuff. You always focus on to make yourself a Brand. this way you can recommend and also can provide services. What to do Next, Well I have created a bunch of blogs and tutorials for you about creating a Website and Blog step By Step. So, read them on the “Ultimate Blogging Course Online Page“. Read Next – How to boost Website Traffic by Keyword Ranking? Hi, Thanks. Do you have a WordPress Website? If not create a new now. Thanks , you should also promote this article…. these days everyone should have his own WordPress website. Thanks wish u a great success. Today I Created My First Website. Hopefully this will Rank after looking at all your SEO tips. Good luck, Keep Reading awesome articles like How to create a Website? 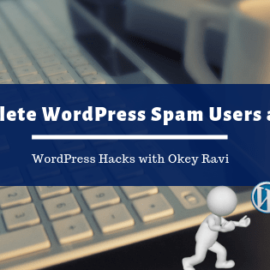 Hi Ravi, This is very good information about how to make a site in wp. It is very useful for us. We can learn a lot here. Thanks for sharing a great article. I watch your YouTube videos and read your blogs regularly. Now, finally I started my blog journey through your tips. Well, My pleasure. if you need any help you can contact. Hii Ravi , Thanks for sharing such a wonderful knowledge keep it up. I have also created my website watching your YouTube Tutorials.